The Islamic State (IS) is consolidating its rule in most of its key positions on both sides of the largely erased Iraqi-Syrian border. In Syria, particularly in the governorates of Aleppo, Al-Hasakah, Ar-Raqqah and Dayr Az-Zawr, IS has instigated its reign through a series of war crimes and crimes against humanity perpetrated against a noncompliant civilian population, Syrian army personnel and non-state parties to the Syrian civil war. In Iraq, IS continues to exercise effective control over large areas, including a preponderance of the Al-Anbar governorate. Bordering Syria, Jordan and Saudi-Arabia, Al-Anbar is the largest of Iraqi governorates, encompassing almost a third of the country. In October, an Iraqi senior government official reported that IS had also positioned 10,000 fighters on the outskirts of Baghdad. The organization's political and military strategy in Iraq does not depart from its modus operandi in Syria, for IS perceives the totality of the sizable swaths of Syrian and Iraqi land seized by the group as a single entity, its expansionist caliphate. 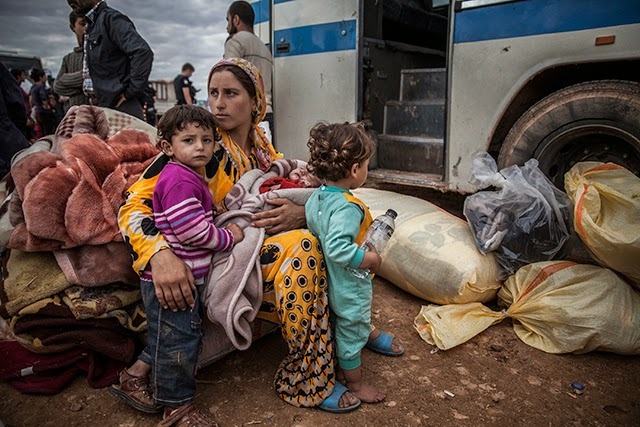 So far, at least 2 million Syrians and Iraqis have become refugees due to IS' military aggression. Long before the rise of the takfiri mercenary armies of IS and al-Qaeda's Jabhat al-Nusra began making headlines in the EU and the United States, the new alignment of forces in the Middle East and at the borders of Turkey and Kurdistan had already stirred up a confrontation between the Sunni jihadist factions and leftist Kurdish movements. Violent clashes between Sunni jihadists and Kurdish forces began over two years ago. From the outset, the Sunni militants were met by local Kurdish resistance of the People's Protection Units (YPG) and Women's Protection Units (YPJ). As the IS intensified its assaults against southern and western Kurdistan, the YPG and YPJ gradually gained media coverage in the EU and the United States. 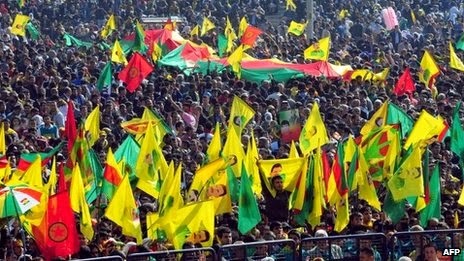 The consistent military success of Syrian Kurdish forces against the takfiri juggernaut brought to the fore a political movement that has been the target of a relentless delegitimation campaign in the EU and the United States for decades: the Kurdistan Workers' Party (PKK). 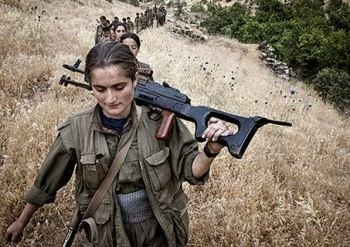 Arguably the largest of all of the many Kurdish political forces, the PKK has been involved in an armed conflict with the Turkish state since the 1970s to secure Kurdish rights. In the summer of 2014, the threat of IS-initiated genocide faced by the Yazidis in the Iraqi town of Sinjar was arguably the most salient event that shed some light not only on the YPG and YPJ, but also on the PKK. After the Iraqi Kurdish peshmerga had abandoned Sinjar, the forces of the YPG, YPJ and PKK stepped up and rescued thousands of Yazidis from near-certain slaughter at the hands of IS. The emergence of the PKK as a deterrent to the Sunni jihadists has led to somewhat uncomfortable reactions in the West. Branded a terrorist organization by the EU, the United States and NATO, the PKK has played a central role in the official US-EU-NATO counterterrorism jargon. 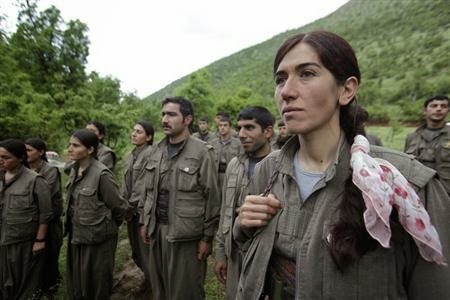 In 2012, the US State Department labeled the PKK "the deadliest" terrorist organization in Europe. Of the many forms of structural racism in the world, the opposition by Turkey to Kurdish cultural and political rights throughout the republic's history stands out as among the most fanatical manifestations of institutionalized discrimination to be found anywhere in the world. Since the establishment of the Republic of Turkey in 1923, the country's Kurdish population has been subjected to numerous massacres and a state-steered policy aimed at linguicide, or language genocide. There have been lengthy periods when publicizing, publishing or broadcasting anything in Kurdish was punishable by law. Regarding the Kurds in Turkey as a disruptive and left-leaning entity that poses a serious threat to Turkish national unity has been a tenet of Turkish political culture. Turkey and the PKK have entered into a peace process to seal a deal, pushing for a set of legal and political arrangements that would be acceptable to both parties. Recently, the PKK has accused Turkey of jeopardizing and slowing down the negotiation process. Turkey's stance towards its Kurdish population and the PKK emerged into the Western limelight when IS began to make massive territorial gains. Ankara has not held back in its attempt to try to turn the rise of IS into a propaganda weapon to discredit the struggle for Kurdish rights in Turkey. At times, this effort has led to rather startling statements by Turkish officials. In October, President Recep Tayyip Erdogan of Turkey clarified that "the PKK and ISIS are the same for Turkey - It is wrong to view them differently. We need to deal with them jointly." In stark contrast to Turkey's IS policy, the PKK has been waging war against IS before the capture of Mosul and the proclamation of the caliphate. The jailed head of the PKK, Abdullah Öcalan, issued a statement transmitted by his visitors, stressing that a broad coalition has to be formed to thwart IS. 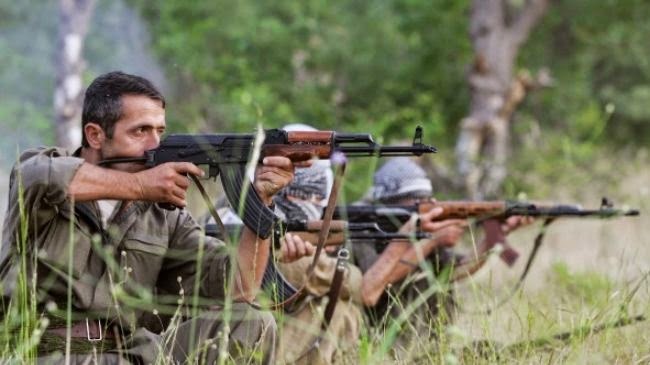 Öcalan asserted that "IS terrorist gatherings want to create a line of attack on western Kurdistan after their recent seizure of Chenkal and Tal Afar. The Kurds must take a common national position against IS terrorists, and they must fight together, as the presence of IS is a danger to the democratic coexistence of the peoples of the region." Öcalan emphasized that the strategy to counter ISIS "requires a struggle by all [peoples], Turkmens, Assyrians, Yazidis and others against the terrorist IS." Echoing Öcalan's remarks, a founding member of the PKK, Cemil Bayik, further outlined the PKK's stance toward IS: "We will attack IS wherever it is found and with all our capabilities. We will not allow it to progress and achieve its goals. And we will be ready to lead a joint struggle alongside all those who resist IS and have a clear position about it, so that we inflict defeat on these mercenaries, liquidate them, and obliterate them from existence." The clout of the PKK movement reaches far beyond Turkey proper. The PKK has been an important player in the background in constructing Rojava's (western Kurdistan's) democratic political system. The PKK has also contributed to Rojava's defensive war against IS invasion. In the battle for Kurdish emancipation in Turkey, the coming months and years will prove pivotal. The EU and the United States can either continue to play a reactionary role - collaborating with Turkey militarily, economically and diplomatically, as in the past - or they can shift policy toward cooperating with the PKK's agenda, which calls for enforcing the Kurdish cultural and political rights. Bruno Jäntti is an investigative journalist who specializes in international politics, the Middle East in particular. He regularly publishes articles and appears in the Finnish and English language media in Finland.